Figure 1. 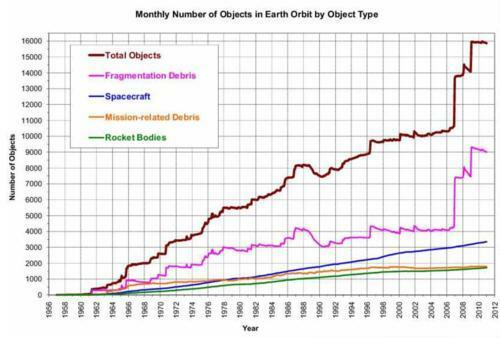 Number of catalogued objects in all Earth orbits vs. time. All catalogued objects are traceable to a specific launch. Spacecraft are payloads, both active and defunct. Mission-related debris and rocket bodies are launch-created debris. Fragmentation debris includes intentional destruction and other subsequent on-orbit breakup of debris. Last week, the crew of the International Space Station (ISS) had to batten down the hatches and hide out in the Soyuz capsule, as a piece of space debris was predicted to come close enough to the ISS to possibly collide with it. Fortunately, the debris passed by without incident. Although the ISS has maneuvered out of the predicted path of debris a dozen times, this time apparently there was not enough warning to plan such a maneuver. It’s only the second time the crew has had to bunker down. Space debris—pieces of inactive equipment, fragments of broken-up satellites and rocket bodies, and other bits of unused “junk”—like all orbiting objects travel at very high speed, so a collision with even a small piece of debris can damage or destroy a space craft. The relative speed between a piece of debris and a satellite at collision may be 10 km/s (22,000 mph) or higher; at that speed, a 1 gm (0.04 ounce) mass carries the same destructive energy as a 100 kg (220 lb) mass traveling in excess of 100 km/hr (60 mph). Since space debris is the detritus of space operations, most of it is located in the same regions of space that are heavily used by satellites. Despite efforts to limit the creation of debris, it continues to be a serious hazard in space. According to Deputy Assistant Secretary of State for space and defense policy Frank Rose, the United States has issued hundreds of notifications of possible collisions with debris to satellite operators in the last year, including 677 warnings to government and private sector satellite owners just to avoid debris created in the 2007 Chinese anti-satellite weapon test. Since the beginning of 2010, satellite owners and operators have maneuvered their low-Earth-orbiting satellites more than 100 times to avoid collisions. Depending on its altitude, debris can stay in orbit for decades or even centuries, thus accumulating over time. Currently there is no effective way to remove large amounts of space debris once it’s in orbit, so controlling its production is of paramount importance. Voluntary debris-mitigation guidelines have been partially successful. Guidelines were developed beginning in the 1990s through the Inter-Agency Space Debris Coordination Committee (IADC) and referred to the United Nations Committee on the Peaceful Uses of Outer Space (COPUOS). They include recommendations for limiting debris generated from launch and re-entry, normal operations in space, and accidental and intentional interference. The guidelines were gradually implemented by space-faring actors and were formally adopted by the United Nations in 2007. The figure above shows that the rate of debris growth over the decade 1996-2006 is significantly less than it was historically, despite the ever-increasing number of satellites. However, the guidelines are not as successful in stopping debris production as they could be. They are not binding, and no mechanisms are in place to enforce them. They may be ignored when an actor values its immediate national security or economic interests higher than the protection of the space environment. They may not be respected when an actor does not have sufficient technical capability to respect them, for example, when the actor cannot accurately maneuver its satellite to avoid an impending collision or when the quality control during production is insufficient to ensure that catastrophic failure modes are minimized. In fact, the guidelines are not as effective as is necessary. The amount of large debris (greater than 10 centimeters in size) has grown by 50 percent in the last four years, primarily because of events that would not have occurred had there been full compliance with the IADC guidelines. The figure shows that debris in recent years has increased significantly over the level expected from the 1996-2006 trend. In the same month as the IADC guidelines were adopted (February 2007), four spacecraft broke up in orbit, generating thousands of pieces of debris. At least three of these breakups could have been prevented by “passivating” them—for example, draining batteries and emptying fuel tanks—at the end of their useful lifetimes, as is recommended by the guidelines. The month previous, China destroyed a satellite in its ASAT test, despite the guideline against intentional destruction of spacecraft in orbit. The testing and use of ASAT weapons by any country could significantly increase the debris population. The satellite destroyed in the Chinese ASAT test was modestly sized (about one ton); the destruction of a single large satellite, which can be as large as a school bus and weigh up to 10 tons, could by itself double or triple the amount of dangerous debris currently at altitudes near Earth. Voluntary guidelines are useful but clearly are not enough to maintain the integrity of the space environment in the long-term. A higher level commitment by spacefaring countries, with more incentives for responsible behavior and repercussions for irresponsible behavior, may need to be the next step.